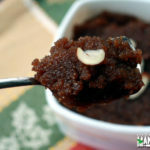 Known as kesari in south India and halwa in north, it is made in every household in India and you never need a special occasion for making it. 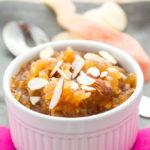 Halwa can be made using semolina, whole wheat flour, lentils, carrots etc. Out of these the one made with semolina (sooji) is the most popular. 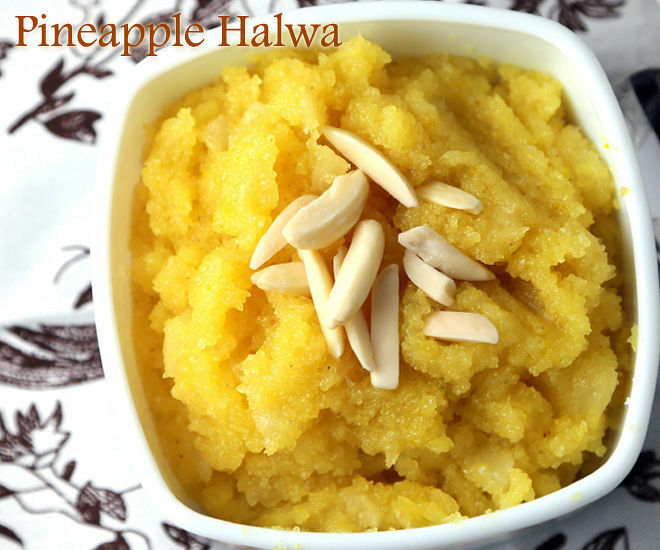 This halwa is basically sooji halwa in which pineapple has been added to give it a tasty twist. 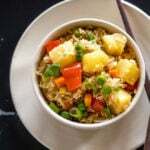 I used canned crushed pineapple for this recipe but you can use real pineapple too. If using real pineapple, chop it into small pieces and cook in water for 5 minutes till it becomes soft and then add in the halwa. Take water and milk in a pan and put it on medium heat. 1. Heat ghee or butter in a pan. 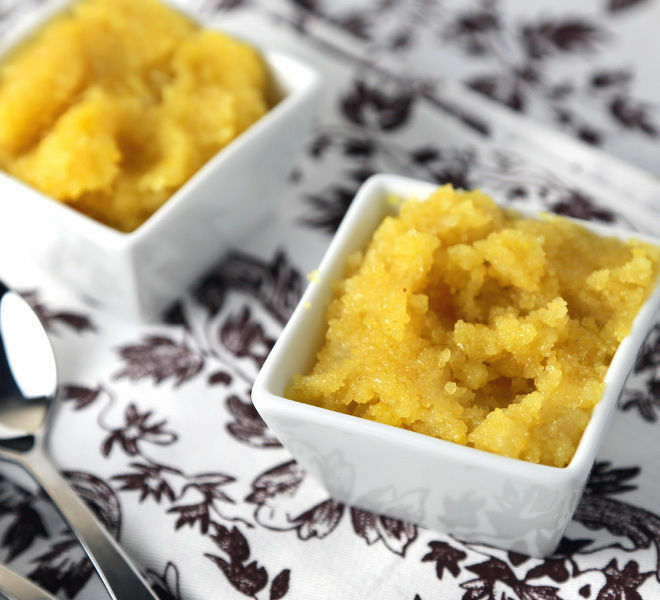 Traditionally ghee [clarified butter] is used to make all types of halwa, but you can use unsalted butter instead. 2. Once the ghee is hot, add semolina (sooji) and roast on medium-low flame till it’s roasted and starts giving a nice aroma. 3. Now add hot water and milk to semolina while stirring continuously. 4. Once the water and milk is absorbed, add the crushed pineapple and mix. 5. 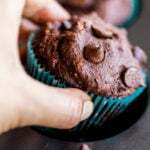 Add sugar and mix. The mixture will again begin to loosen up when you add the sugar, keep stirring making sure there are no lumps. 6. Add food color and simmer on medium-low flame for 2 minutes. Add cardamom powder and switch off the flame. Garnish with nuts of your choice and serve warm. 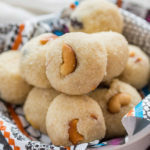 * If using nuts, fry them in little ghee first and then use them to garnish the halwa. I didn’t do that because I made this for someone who is allergic to nuts so I skipped that step. * Adjust the sugar to taste, the canned pineapple already had sugar in it so 3/4 was good enough for me. 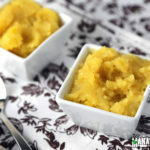 Indian sooji halwa with a touch of pineapple! Heat water and milk in a pan. Heat ghee or butter in a pan. 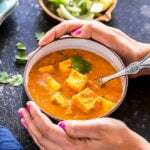 Once the ghee is hot, add semolina (sooji) and roast on medium-low flame till it's roasted and starts giving a nice aroma. Add hot water and milk to semolina while stirring continuously. Once the water and milk is absorbed, add the crushed pineapple and mix. Add sugar and mix. The mixture will again begin to loosen up when you add the sugar, keep stirring making sure there are no lumps. 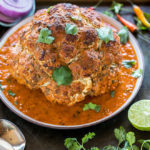 Add food color and simmer on medium-low flame for 2 minutes. Add cardamom powder and switch off the flame. When making this do you used crushed canned pineapple in 100% pineapple juice or in heavy syrup? If I am using fresh pineapple (not the canned in sugar syrup variety) should I cook it separately first? 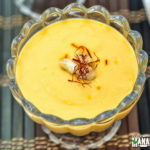 I tried the sheera with fresh pineapple and while the initial taste is good, it leaves a slightly bitter taste in the mouth. What am I doing wrong? hmm bitter taste of pineapple can be because you didn’t entirely remove the skin of the pineapple,so check that out. And yes if using fresh pineapple, cut into cubes and boil the cubes for 5 minutes till they becomes little soft..hope this helps! Is it ok to cook milk and pineapple together?